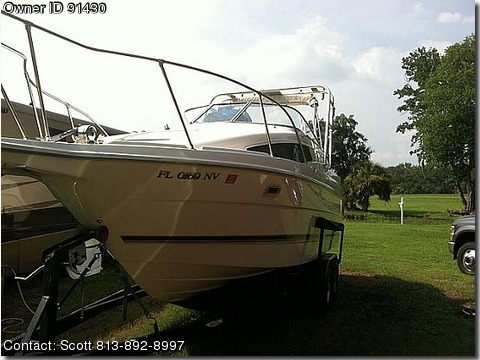 Call owner Scott at 813-892-8997. 5L Mercruiser with Bravo 3 outdrive, twin counter-rotating props Bimini Top Boat Cover - Custom - 18 ft. thru 25 ft.
Bridge Enclosure Battery Charger - Dual 10 amp Depth Sounder Fish Finder - Max Depth 600' GPS - Color Fixed Mount wCartography Garmin Stereo - amfm cassette w4 speakers Downriggers 2 - Manual Microwave Oven Pressure Water System Refrigerator - ACDC - 6 cu. ft.
Air Conditioning - Carry On Air Conditioning - Self Contained - 16,000btu Batteries - Dual wSwitch Cavitation Plates Adjustable Dual -Prop Fire Ext. 75 - 100 cu. ft.
Engine Compartment Halon Fire Suppression Full Head Propeller Stainless Steel 3-Blade Swim Step wFold Down Ladder Transom Bracket Sgl Eng wSwim Pltfrm. Portable Gas Grill Aluminum Radar Arch Anchor, rope, fenders VHS Marine Radio Trailer Included.